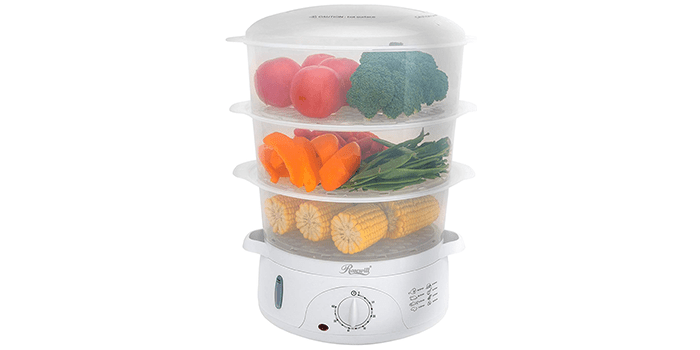 The general consensus is that steaming vegetables is a lot healthier than any other preparation method, thus the reason why vegetable steamers are so popular nowadays. A mix of vegetables will always be at the core of a healthy diet, no matter what the diet is for or what else it contains. Having said that, you should understand that not all vegetable steamers are created equal and that some are definitely better than others. A steamer’s efficiency can be influenced by anything from the seals, design, and general construction of the unit, to its steaming mechanism and capacity. With that in mind, let’s take a look at the ten best vegetable steamers out there so that we’ll get a better understanding of what they’re all about. 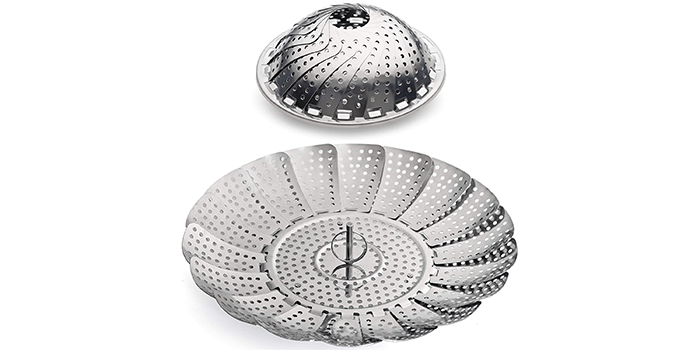 Crafted for steaming various types of food and vegetables, the Joseph Joseph 40023 Lotus Steamer Basket is free from BPA, harmful elements and is resistant to scratches. Equipped with self-adjusting sides, it can easily fit into a wide range of different sized pots and pans with a minimum diameter of approximately 6.25 inches. Made from heat-resistant polypropylene and silicone, it features silicone side walls, feet and a finger guard that protects your fingers while removing the steamer. Ideal for stainless steel pots and pans as well as non-stick cookware, it comes with a large storage area and can be washed in the dishwasher without worry. 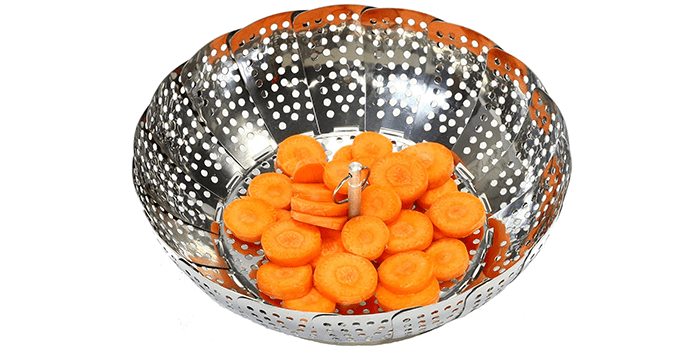 Made from premium quality 100% stainless steel, this steamer basket from Chef Craft is known for its durability and performance. Designed to work with all kinds of pressure cookers, this 6-inch steaming basket expands up to 9.5 inches and contracts, automatically taking the shape of the pot or pan. For easy removal, it comes with a convenient ring which protects your fingers from getting burned. Light in weight, sturdy and reliable, it is easy to maintain and can be washed in the dishwasher. 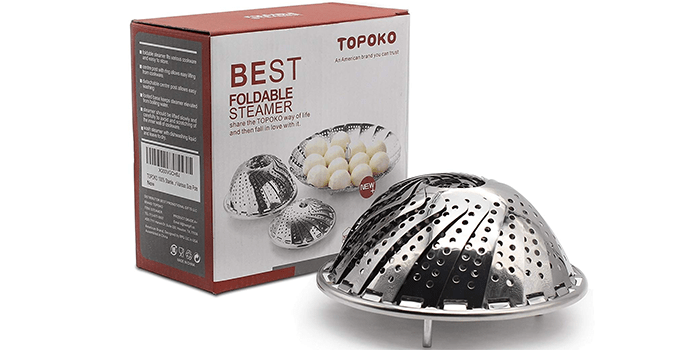 The Topoko Vegetable Steamer Basket is a premium quality foldable device made from rust-free, ultra-durable stainless steel. Ideal for utilizing with pressure cookers, pots, and pans that are 8 inches in diameter or more, this device is great for steaming eggs, vegetables, seafood and more. Thanks to its 2-inch handle with a ring on the top, it enables easy removal without burning your fingers. Featuring sturdy 1-inch legs, it makes it easier to store and can also be used as a draining tray for your fruits and vegetables. Easy to clean, it is dishwasher safe and extremely space-efficient. Equipped with 3 stackable tiers measuring 9 liters, the Rosewill Electric Food Steamer comes designed with transparent steaming baskets that are made from BPA free materials. Including the latest turbo steam ring technology with 800 watts of steam power, it generates heavy duty steam in less than 40 seconds. Ideal for steaming vegetables, fish, and rice etc. It comes with 60-minute shut-off timer that automatically turns off the device when there is no water left. For easy refilling of water, the device contains a transparent water level indicator on both sides that shows you the level of water remaining. It also comes with an inbuilt holder for eggs and a rice bowl that is perfect for steaming white and brown rice. The Norpro 1-Quart Mini Steamer Cooker is a 3-piece set that includes a premium quality stainless steel steaming basket, a base pot and a vented lid made from tempered glass. 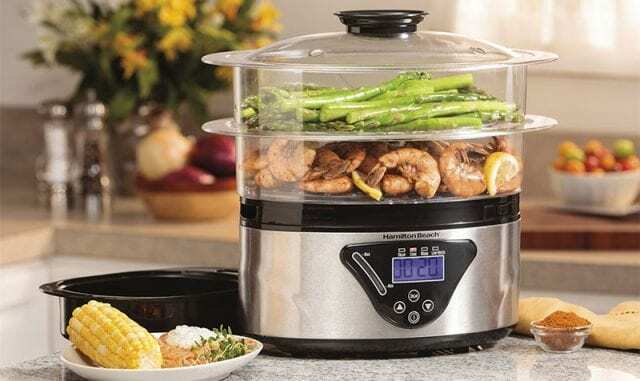 Ideally designed for steaming small portions of food, this steaming device helps to retain the vitamins and nutrients present in the food, while maintaining its flavor and deliciousness. This device can also be utilized to boil pasta, noodles, eggs, vegetables, make soups, heat water and more, but without the steamer. Thanks to its heavy-duty Tri-Ply Encapsulated base, it evenly distributes the heat, cooking the food perfectly with no hot spots. 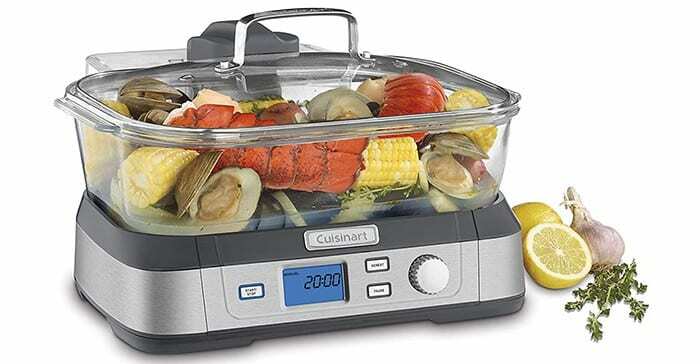 Featuring a steaming tray made from premium quality stainless steel, a heavy-duty glass tray with a glass lid with stainless steel rims, the Cuisinart STM-1000 Digital Glass Steamer is another great addition to the list of top vegetable steaming devices. Equipped with a powerful steaming mechanism, it comes with a 1-liter detachable water tank and a 5-liter glass pot that is dishwasher safe. The LCD display screen comes with an easy set of controls that include a start/stop button, a reheat button, and a pause button and a sound alert feature that can be activated when needed. With 5 food settings that are pre-programmed into the device, users can choose from seafood, grains, vegetables, poultry, and a manual setting. For ease in operation, it also comes equipped with an automatic 60-minute timer. Known for its high quality, performance and ease of operation, the OXO Good Grips Stainless Steel Steamer is designed to efficiently and evenly steam various kinds of food. Made with premium grade stainless steel, it fits into any pressure cooker, pot or pan that is 8 inches in diameter or above. Equipped with a detachable handle that can be extended for ease of removal or locked into position during filling or transporting, it features a hole in the handle for a fork, to prevent your fingers from getting burned. 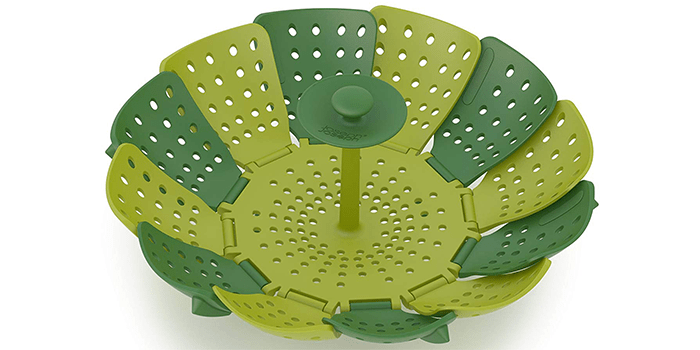 Light in weight compact in size and space efficient, this steamer basket is easy to clean and dishwasher safe. The Hamilton Beach Digital Food Steamer is a premium quality kitchen utility that comes designed with a great set of features. With 2 tiers for steaming, it can be utilized for preparing small quantities of food separately or an entire meal at once, if the divider is removed. Lightweight and compact in size, this steamer fits into your kitchen cabinet with ease. Equipped with an automatic warming function, the device switches to warm when the food is prepared and ready to eat. Thanks to its easy to operate digital control pad, users can set the timer and adjust other settings without any trouble. 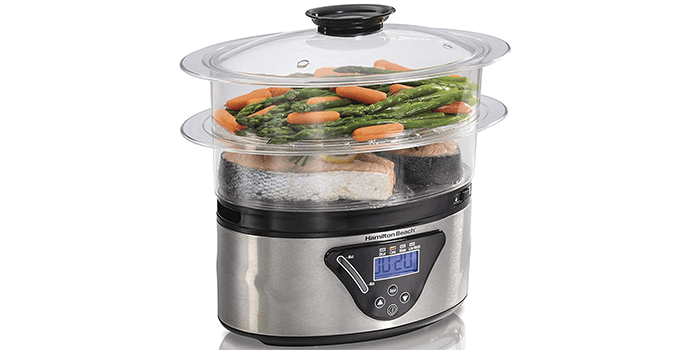 Made from premium grade materials, this food steamer is ideal for steaming vegetables, fish, rice, and other foods. 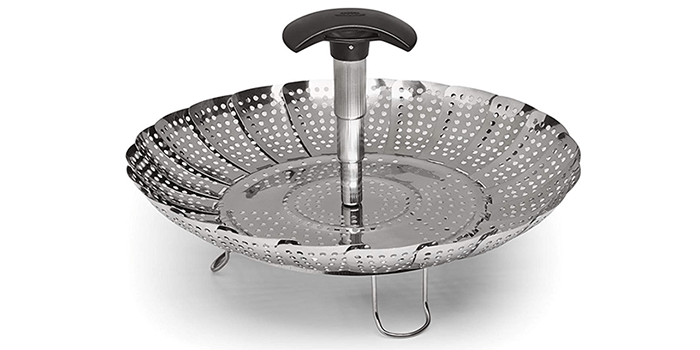 Made from 100% high-quality stainless steel, the Sunsella Vegetable Steamer includes sturdy stainless steel legs, a stainless steel handle with a convenient ring for easy removal. Thanks to its versatile construction, this steamer can be placed into any pressure cooker, pot or pan with ease. Space-efficient, it can be folded and stored in the smallest space. For steaming large food items, simply remove the handle in the center to get more space to place your food. Durable, light in weight and convenient to use, this vegetable steamer measures 5.3 inches when closed and 9.3 inches when expanded. 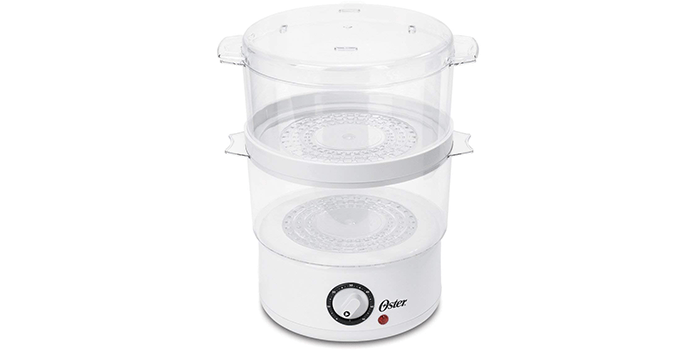 Designed to steam meat, vegetables, fish and poultry, the Oster Double Tiered Food Steamer cooks your food without any oil while retaining its important nutrients and natural flavors. Thanks to its special 2-tiered construction, it allows you to cook 2 food types at once. 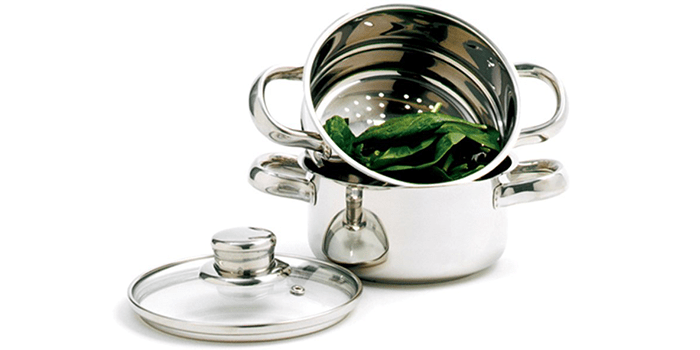 Featuring two 5-quart, transparent bowls for steaming, it enables users to keep a close check on the progress of their cook. Made from durable materials, this food steamer comes equipped with a 60-minute timer that automatically shuts off the device when completed. overall, it is one of the most reliable vegetable steamers out there.